Robert Hovencamp began his musical studies at an early age, and soon began studying at the University of Cincinnati’s prestigious College-Conservatory of Music preparatory department. He later earned his bachelor’s degree at CCM, studying piano, organ, and opera performance. He also studied organ and liturgical music at the Cincinnati Bible Seminary. At Cincinnati, he studied voice with Andrew White, and organ with W. Edwin Domb, and E. Wayne Berry. He continued his post graduate studies at Northwestern University in the vocal studio of Hermanus Baer, and the Lyric Opera Center for American Artists in Chicago. He was an international finalist in the Luciano Pavarotti Competition. 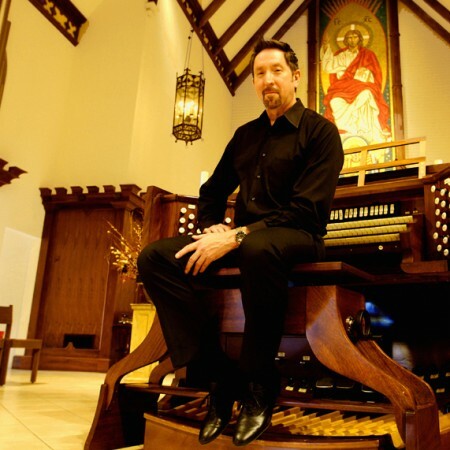 Robert is currently the organist and choirmaster at St. Edmund’s Episcopal Church in San Marino, and is a frequent guest organist and recitalist at the Cathedral of Our Lady of the Angels in Los Angeles. Previous posts include Associate Organist of Beverly Hills Presbyterian Church, Organist at Stephen S. Wise Temple in Los Angeles, and Interim Organist and Choir Director at Wilshire United Methodist Church in Los Angeles. At St. Edmund’s Episcopal Church, Mr. Hovencamp oversaw the restoration and expansion of the Aeolian-Skinner/Rosales pipe organ, and instituted their Sunday Afternoon Recital Series. Now in it’s fifth year, the series presents recitals by Southern California’s finest local organists. In 2013, he accompanied LA Philharmonic Concertmaster Martin Chalifour in recital at St. Edmund’s for the San Marino Centennial. Robert appears regularly with the Los Angeles Opera, has also appeared as a vocal soloist with the Los Angeles Master Chorale, Lyric Opera of Chicago, Chicago Opera Theater, the Grant Park Symphony, as well as numerous other US opera companies. He has also served as Associate Conductor of the Long Beach Opera. You can also view Robert’s video performances on his YouTube channel, which you can reach by entering Robert Hovencamp in the YouTube search bar. Robert serves on the executive board of the Los Angeles chapter of the American Guild of Organists.